Cozy hideout with two entrances, so your cat won’t feel cornered. The Vesper Cubo is a modern lounging cube for cats. The Vesper Cubo Tower is a 3-level adventure tower fit for lounging, climbing, scratching and hiding. Get your sunshine on with the Vesper Cabana! This two-toned piece of cat furniture contains a snug hideout with soft, padded cushion at the bottom and a relaxing hammock on the top! The hammock gives your cat a 360 degree view of its surroundings and even the hideout below is open on all sides so your cat will never feel trapped. Vesper V Cube Rattan Cat Bed & Scratcher is for fans of Bauhaus-style furniture or lovers of pure elegant shapes. -Cube cave. Vesper Hagen cat scratchers. V Furry long fake fur. Laminate in walnut look or water-based varnish coat. The V-PLAYSTATION is a discovery centre, play area and learning device in one. Colour: Walnut. Colour: White. Active play furniture. The V-PLAYSTATION is a discovery centre, play area and learning device in one. The Vesper Condo is a tower with 3 levels for cats to nap, play and lounge on. Each level is open on all sides so your cat will never feel cornered. This piece has a retro 70's design and is equipped with soft cushions that are detachable and can be replaced. Vesper Cat Furniture, V-High Base Walnut 56 x 56 x 121.5cm. Cube cave with two platforms. Rattan Toy. 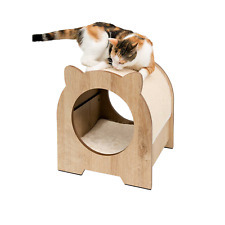 Clambering, playing and relaxing, your cat can do it all with the Vesper V-Double play object. The V-Double will stave off boredom in your cat. This play object has two cubes with pillows and a plateau that your cat can sleep or play on. The V-BOX large is our compact adventure world for cats. The compact design makes the V-Box easy to set up in a limited space, making it more versatile: be it next to the sofa, in the bedroom or in the middle of your living area. Cube cave with two platforms. Colour: Walnut. Size: Walnut. Pet Type: Cat. Date First Available: 24 Jan. 2015. Item Weight: 10 Kg. Item model number: 52045. Quantity: 1. Vesper ist eine außergewöhnliche Katzenmöbel-Serie in zeitlosem, modernem Design. Katzen sind anspruchsvolle Wesen. Ihre Besitzer auch. Anspruch an das Design, die Materialien und die Verarbeitung prägen das Bild von Vesper. Vesper V-Box Cat Tree, Large in Walnut. The compact design makes the V-Box easy to set up in a limited space, making it more versatile: be it next to the sofa, in the bedroom or in the middle of your living area. 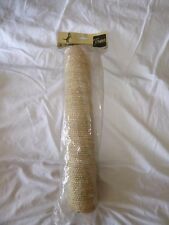 Vesper VP Natural Sisal Tube for Cat. Size: 8 x 50 cm. Date First Available: 27 April 2016. Batteries Included: No. Batteries Required: No. The Vesper Play Centre is a discovery centre, play area and learning device in one. The compact design makes the Play Centre is easy to set up in a limited space, making it more versatile: be it next to the sofa, in the bedroom or in the middle of your living area. Combine several pieces of furniture and, in doing so, create a unique Vesper adventure tower for your cat. The compact design makes the V-Stool easy to set up in a limited space, making it more versatile: be it next to the sofa, in the bedroom or in the middle of your living area. The Vesper V-Box small is our compact cat furniture in a modern design. The compact design makes the V-Box easy to set up in a limited space, making it more versatile: be it next to the sofa, in the bedroom or in the middle of your living area.